Even the most disciplined athlete might be forgiven for reaching for a chocolate egg or two at this time of year. Whatever your preference, it is hard to avoid the plethora of treats available over Easter. But is this such a bad thing? Could athletes actually see some benefit from indulging in a little chocolate over the Easter holiday? Chocolate has an established place within the sport sponsorship family. Winter sport, in particular, has benefited from a long-term relationship with Milka across mainland Europe. Not to be outdone the American Ski and Snowboard Association has partnered up with Hershey’s. In the UK, Cadbury has experienced an up and down relationship with sport. A successful sponsorship of the London 2012 Olympic Games prompted its recent confidence to sign up as the Official Snack of the Premier League. However, back in 2003 Cadbury had to endure a backlash to it's partnership of the Youth Sport Trust, which the Food Commission criticised for “encouraging unhealthy behaviour” with its proposed school sports rewards scheme. Whilst a little of what you like is said to be good for you, remember that not all chocolate is born equal. Dark chocolate is rich in cocoa-derived phytochemicals that may have bioactive properties including caffeine and flavanols (Stellingwerff et al, 2014) and the potential health and performance benefits of these flavanols is currently of great interest within nutritional research. The dietary flavanols that occur naturally in cocoa powder (namely Epicatechin, Catechin and Procyanidins) have been found to provide anti-inflammatory, anti-oxidant and cardiovascular health benefits - such as decreased blood pressure and improved blood circulation. The last of which has been identified as a potential means of enhancing nutrient and oxygen delivery to the working muscles and removing waste by-products, potentially enhancing performance and recovery. Dark chocolate consumption has now been identified as an alternative means of raising the bioavailability of nitric oxide, the compound thought to be responsible for the health and (albeit mixed) performance benefits associated with beetroot juice. But how does eating a bar of dark chocolate translate into performance benefits for athletes and could it be the secret behind Federer’s success? The reality is, at present the literature is in its infancy and, subsequently, is sparse. Stellingwerff et al (2015) and Decroix et al (2017) have observed that acute doses of dark chocolate can have an effect on key processes that could lead to performance benefits. However, both studies failed to establish a link to improved exercise performance. It may be the case that dark chocolate needs to be consumed over a greater time-period for the physiological changes to provide performance benefits. Patel et al (2015) examined the impact of supplementing both dark and white chocolate (40g/day) for two weeks. The authors found that in a subsequent bike test, the gaseous exchange threshold (during sub-maximal exercise) and time-trial performance (2-minute max sprint) both increased following the supplementation of dark, compared to white chocolate. Unfortunately, as the flavanol and nitric oxide concentrations were not directly measured, the causality of these performance benefits could not be definitively established. So even if Roger Federer has been an avid consumer of Lindt’s Excellence dark chocolate it’s difficult to link his continued performance excellence with this new area of nutritional interest. However, with Easter upon us and many hoping to enjoy a traditional chocolate treat, it seems that if you manage to fit in a few training sessions and then opt for dark chocolate, you can justify it as part of the latest nutritional research. Sport Science Agency works with brands, broadcasters, rights holders and agencies to create insight, experiences and content from the latest sport science research. If you want to know more just drop us a note via info@sportscienceagency.com and we can arrange to meet and share a bar of dark chocolate or go for a healthy performance boosting drink. How does he still do it? On Saturday I was called by a researcher from BBC Radio 5 Live. He was interested in how Roger Federer is still able to perform at the top of tennis despite his age. Since that conversation, Federer has become the second oldest Grand Slam winner in the open era (Ken Rosewall won titles at 35, 36 and 37). However, since 2000, only Sampras (31), Agassi (32), and Federer himself have won grand slams while being on the plus side of 30. At 35, Federer’s latest win at the Australian Open is exceptional. So how is he still able to compete in such a competitive professional sport? The ageing process begins to induce a decline in male physical ability around the early 30’s. Borgest and a team of researchers in Australia highlighted the naturally occurring declines in metabolic, cardiovascular and hormonal systems as the precursors for performance decrements in their review study of 2015. These genetic factors cannot be escaped. And while, in well trained populations, the performance effects often do not become significant until their early 40’s, In the tiny margins of elite sport any decline can become evident very quickly. What makes Federer’s achievement even more impressive is the nature of tennis as a sport. Whilst endurance capacity has been shown to stand up well via training in athletes in their 30’s, the ability to produce power due to the speed of muscle contraction can begin to significantly decrease in your 30’s (Kostka 2005). As tennis moves towards the power end of the sporting spectrum (we have previously talked about its shift), any drop in this key component would surely impact performance. There is also a psychological element to ageing. For many, accepting you are no longer capable of the same levels of athleticism is difficult. Others are able to adjust their performances to rely on greater experience and knowledge of the various facets of the game. In this case adjustments, rather than relying on experience or knowledge, are probably the key. I would argue experience and knowledge can have an impact in team sport or against lesser players, but in the upper reaches of tennis, against players with similar levels of mastery, it is difficult to argue that Federer’s ‘experience’ would somehow plug a physical performance gap. 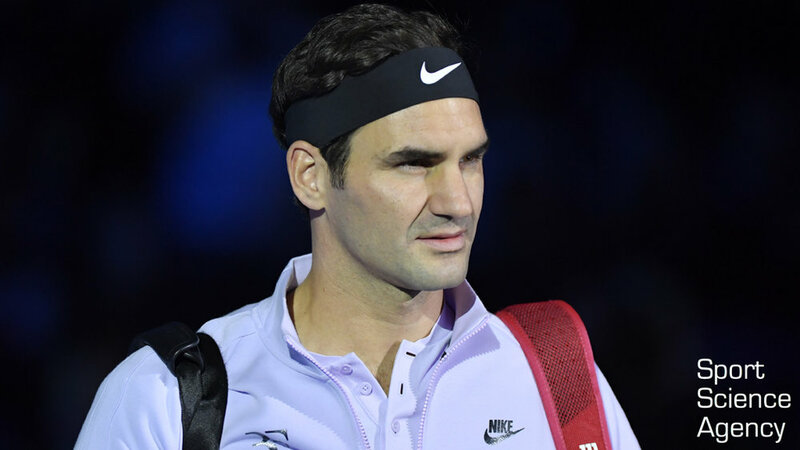 A more plausible explanation is that at 35, Federer is just below the cusp at which focused training, nutrition and other adjustments are no longer sufficient to maintain and manage the inevitable age-related declines. This would fit with Borgest et al (2015) who said “performance has been shown to be maintained until approximately the age of 35 years after which it declines slowly”. Remember Federer’s well-publicised change of racket size in 2014? The new racket gave him a bigger sweet spot, allowing more room for error. Equipment changes are often a response to physical changes. Was this the first sign that his movement was slowing (which could have been linked to the power insight we spoke of earlier). Did other changes occur in his training and lifestyle to maintain his place inside the world elite? In the 5 years prior to 2016, Federer had played an average of 76 matches across 19 tournaments. Due to injury and the need to recover properly, he played only 28 matches across 7 tournaments in 2016. The decision to recover and take the time to develop a fitness programme that could address the specific needs of an ageing body have to be key factors in his victory - that and the early departure of Andy Murray who he was due to play in the quarter-finals. Federer is clearly exceptional. His Grand Slam win at the age of 35 helps cement his legendary status within the game. To maintain his performance levels takes dedication to a lifestyle many of us couldn’t cope with. To recognise the need to adapt his training and preparation displays a psychological maturity, often missing in others. Add to this the luck of excellent genetics and you have a 35-year-old Grand Slam Champion. Roger Federer………..The Greatest of all Time. With Andy Murray now sitting on top of the world and the biggest change to the top ten in years, we at Sport Science Agency thought it would be a good time to take a look at the changing times in men’s tennis.